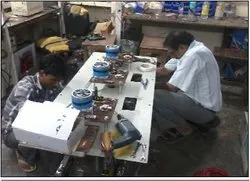 Established in 1986, we, Desta Electricals (India) Private Limited, are the manufacturers and trader of Voltage Stabilizer, Servo Stabilizer, Isolation Transformer and much more. A detailed catalog of Desta Electricals (India) products is enclosed for your kind perusal and reference. In addition to this, our vendors are selected after a thorough market research on the basis of their market creditability, their satisfied clients, ability to handle bulk necessities and competitive price structure. We deal in our own registered and manufactured brand Desta. Under the proficient guidance and management of our mentor, “Mr. Mahendra Singh”, our organization has witnessed the pinnacle of success in the industry. He has the long understanding of the domain and so we are able to cater our clients with innovative range. Further, we regularly upgrade our products to match with the latest trends in the market. Desta Electricals (India) Private Limited. Is a well-known an ISO Certified Company, we started the production of voltage stabilizer way back in year 1986 as a proprietor concern. Since then we have come a long way to put the company in its present form. Today we have three establishments One in Delhi second in Mathura, Uttar Pradesh & the third in Gwalthai, Himachal Pradesh. We are now engaged in the production of Servo Voltage Stabilizer Dimmer and Linear (Roller) Type, Distribution Transformer, Automatic Voltage Stabilizer, Manual Voltage Stabilizer, Isolation and Ultra Isolation Transformer, On line UPS, Step-up & Step-Down Transformer, Auto Transformer, Inverter, Battery, Chargers, Variac (Variable Transformer), Toroidal Transformer, other Electrical & Electronics Instruments being used for Power conditioning products and there services, on large scale, keeping in mind the needs of the small organization as well as big Industries, and to reduce the blow of today’s harsh power supply and electrical environment. We are an ISO 9001:2008 Certified & a registered NSIC, D&B D-U-N-S® Number 67-644-3748 and SSI Unit. We are in the Indian Market since 1986 and we adhere to IS: Standards for our products under the supervision of qualified engineers and technical Staff having R&D facilities at their end. We enjoy the reputation of being regular suppliers to various Public Sector Undertaking, Housing Board, Government Dep’t, Corporate Houses, Schools, Colleges, and Hospitals. We also undertake the AMC`s for Servo Voltage Stabilizer. Being a customer centric organization, we are committed towards achieving highest satisfaction level of the customers. The range of products is brought to the esteemed clients after meticulous manufacturing, rigorous quality control checks and in-house testing measures. Moreover, the reliable, efficient, cost effective, & aesthetics of our product saves energy and serves the nation. The Directors of our companies are the visionary men behind the progress and uplift of the Company to the present level of Success. Quality assurance department is run with the assistance of highly skilled professionals backed with well-equipped Morden test lab. The company has implemented Total Quality Management (TQM) practices operating right from every stage of product manufacturing to the final inspection prior to delivery. May we look forward to receive your valuable enquiries / order to supply the required equipment to your satisfaction. We would appreciate your response to our letter and can assure you of our best services at all times to come. The key to success, and responsible for our company’s growth, is our R & D. Our R & D Team comprises highly experienced and dedicated experts in the field of Power Systems and related areas. Every effort is made to keep the development cycle short without losing focus on key issues like reliability, maintainability and the need to deliver value-for-money. Our future is dependent on our ability to provide quality and services that meet or exceed our customers’ requirement in terms of price, delivery, and quality. And we achieve this objective under the assistance and with proper guidance of our R&D team. The key objective that Desta Electricals (India) Private Limited focuses on is to develop products that are relevant, affordable, and easy-to-maintain and offer true value-for-money to the end-users. Desta Electricals (India) Private Limited has attained a remarkable place in the global market creating unequaled products. This has occurred due to the combination of factors, chief among them the quality and reliability of our products, user-friendliness, sensible pricing, efficient services, wide national network, global presence, the capable and experienced team of engineers, reliable sales and support services. Our company is equipped with state-of-the-art infrastructure that includes high-technology, and equipment like Power Analyzers, Digital Scopes, Waveform Generator, Curve Tracer, Protocol Analyzer, Spectrum Analyzers, Brake Dynamometer and Programmable Power Supplies. Our significant infrastructure enables Desta Electricals (India) to develop design capabilities that are at par with international standards.